My boys LOVE video games, the one thing I have noticed is that when I buy games for our Wii is that games that are just for fun or learning games my boys find boring and never get played in our house. Recently with the HOURS of play our Wii is getting, I decided that the boys need to get out and moving more and they did not like that. Recently my family was sent the new JumpStart Get Moving Family Fitness Wii game and it was a hit…. I got them moving around and they did not have to stop playing video games and going out in the heat…. It was a win-win !!! We have found this game is not just for kids, but it is great for the whole family! This is a great was to spend family time that is fun and beneficial! Some of the games include cycling, running, basketball, baseball, football, balancing, and volleyball. Design your own character to race and play. Build customized routines for extra challenge. Compete head to head or play solo. Buy: The game will be in stores on June 15th and will retail for $29.99 and is rated E for Everyone with Comic Mischief by the ESRB. For purchase details please visit JumpStart. 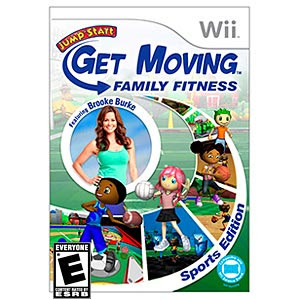 JumpStart Get Moving Family Fitness Wii Game ! Visit JumpStart and tell me something you learned on their site! I didn't know Jump Start had Wii games! I learned about the Escape From Adventure Island Wii game. I didn't realize all the great educational tools that they have that also help unite families. I learned the Jumpstart experience is more engaging,interactive, and fun than ever. I follow with Google Friends Connect as LUCKYLADY42. I liked Life In A House Of Blue on Facebook. I learned that it also teaches math, reading, and critical thinking skills so kids get a real jump start in life. JumpStart can be purchased at Best Buy and Target. I learned it teaches many skills to children!! I learned the company has received over 500 awards. JumpStart is currently running a Summer Scavenger hunt online. Looks like fun! I learned that they were the Mom’s Choice Awards 2008 Silver Recipient. I learned that the JumpStart brand has been a leader in the educational software market for over 10 years. You can get Bonus coins linking your Jump Start account to your Facebook account. 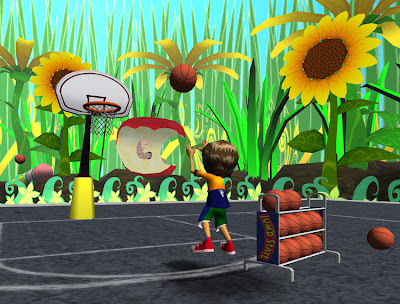 I just learned JumpStart made Wii games. I did not know that. Jumpstart is an awesome site. There is so much for kids to learn and explore through the Interactive game. From creating your own jumpee, to playing games, learning math and reading, and so much more. My son has learned so much through Jumpstart. The journey of learning has just begun. I learned that you can buy it at Best Buy. They won the Toy Man Award of Excellence in 2008. I didn't know that jumpstart had wii games. I learned that this game will be available at Best Buy, Target, and Walmart! Mandatory - I learned that "JumpStart is an award-winning adventure-based 3D virtual world that is super-personalized, wildly imaginative and really fun, but don't let that fool you - it also teaches math, reading, and critical thinking skills so kids get a real jump start in life." I learned that it teaches math, reading, and critical thinking skills to kids. I learned that JumpStart is an award-winning adventure-based 3D virtual world that is super-personalized, wildly imaginative and really fun. There is a number of educational tools! I learned that they earned the National Parenting Seal of Approval! Thanks for the chance to win!